Too many choices. Using automation to reduce choices and dominate your money. It’s not about willpower. More than anything else, the psychology of automation is critical to successfully getting control of your finances. In one study, researchers found that making 401(k) accounts opt-out instead of opt-in — in other words, making employees automatically participate, although they could stop at any time — raised contribution rates from less than 40% to nearly 100%. Defaults matter. We’ve all read The Four Hour Workweek so you know about the benefits of doing less. Today, Tim’s given me the opportunity to show you the details of the personal-finance system I’ve built over the last five years. It’s a way to automate the day-to-day decisions you have to make — paying bills, investing, rebalancing, cutting down on spending, increasing spending on things you love — and focus on the things you care about. Using “The Next $100” Principle, which I’ll show you below, your automated money flow will automatically route money where it needs to go — investments, paying bills, savings, and guilt-free spending. And you can focus on the things that matter to you, instead of being a slave to your personal finances. Michelle gets paid once a month. Her employer deducts 5 percent of her pay automatically and puts it in her 401(k). The rest of Michelle’s paycheck goes to her checking account by direct deposit. Her system also automatically pays her fixed costs like Netflix, cable, and insurance. She’s set it up so that most of her subscriptions and bills are paid by her credit card. Some of her bills can’t be put on credit cards—for example, utilities and loans—so they’re automatically paid out of her checking account. Finally, she’s automatically e-mailed a copy of her credit card bill for a monthly five-minute review. After she’s reviewed it, the bill is also paid from her checking account. The money that remains in her account is used for guilt-free spending money. To make sure she doesn’t overspend, she’s focused on two big wins: eating out and spending money on clothes. and she keeps a reserve of $500 in her checking account just in case. (The couple of times she went over her spending, she paid herself back using her “unexpected expenses” money from her sub-savings account.) To track spending more easily, she uses her credit card as much as possible to pay for all of her fun stuff. If she uses cash for cabs or coffee, she keeps the receipts and tries to enter them into Mint as often as possible. In the middle of the month, Michelle’s calendar reminds her to check her Mint account to make sure she’s within her limits for her spending money. If she’s doing fine, she gets on with her life. If she’s over her limit, she decides what she needs to cut back on to stay on track for the month. Luckily, she has fifteen days to get it right, and by politely passing on an invitation to dine out she gets back on track. By the end of the month, she’s spent less than two hours monitoring her finances, yet she’s invested 10 percent, saved 5 percent (in sub-buckets for her wedding and down payment), paid all of her bills on time, paid off her credit card in full, and spent exactly what she wanted to spend. She had to say “no” only once, and it was no big deal. In fact, none of it was. We’ll get to creating an automatic personal-finance system for you in a second. First, we need to iron out a few wrinkles to make sure your banks and credit cards aren’t screwing you. The first steps are setting up the right financial accounts (saving, checking, investing), which I detail in chapters 1-3 of my book, but I’m just going to give you some core negotiation scripts to use against your financial institutions. With a customer-acquisition cost that’s typically between $300 and $1,500, financial companies don’t want to lose you — especially since most Americans are horrible negotiators and are afraid of using the phone. If you do it, you’re one of a select few who get preferential treatment. First, I recommend you create a simple spreadsheet where you list all your accounts. Without it, you’ll activate a passive barrier that will make automation and negotiation far less likely to succeed. Download a spreadsheet here. “Well, this Indian blogger dude told me I could.” (Nobody cares. But it would be cool if a thousand customers called their banks and said this. Your APR, or annual percentage rate, is the interest rate your credit card company charges you. The average APR is 14 percent, which makes it extremely expensive if you carry a balance on your card. Put another way, since you can make an average of about 8 percent in the stock market over the long term, your credit card is getting a great deal by lending you money. So, call your credit card company and ask them to lower your APR. If they ask why, tell them you’ve been paying the full amount of your bill on time for the last few months, and you know there are a number of credit cards offering better rates than you’re currently getting. In my experience, this works about half the time. It’s important to note that your APR doesn’t technically matter if you’re paying your bills in full every month—you could have a 2 percent APR or 80 percent APR and it would be irrelevant, since you don’t pay interest if you pay your total bill in each month. But this is a quick and easy way to pick the low-hanging fruit with one phone call. The vast majority of people don’t need to pay any annual fees on their credit cards, and because free credit cards are so competitive now, you rarely need to pay for the privilege of using your card. The only exception is if you spend enough to justify the extra rewards a fee-charging account offers. If you do pay an annual fee, do a break-even analysis to see if it’s worth it. Hundreds of my readers have either (1) had their annual fee refunded, or (2) switched to a no-fee card. You don’t believe me that it can be so simple? It is. Anyone can do it. There are other advanced negotiating strategies and tactics, including optimizing your debt-to-credit ratio, but I’ll leave those for another day. Finally, if you decide to switch accounts, which ones should you use? I cover this in detail in the book, but here’s what I use ING Direct for savings and Schwab Investor Checking, where I earn interest and get 100% of ATM fees refunded from anywhere. Too many people try to save money on 50 things and end up saving 5% on everything — and causing themselves a huge amount of stress that makes them give up entirely. Instead, I prefer focusing on my top two discretionary expenses (for me, eating out and going out), and cutting 25%-33% off over a period of six months. This generates hundreds of dollars of extra cash flow that I re-route to investing and travel. To show you how automating your accounts works, I’ve prepared a 12-minute video that shows you how to build a personal-finance infrastructure that automates your money so you can spend less than 1 hour per week monitoring your money. Everything will be done automatically — investment, savings, bills paid. Everything. Examples: Your 401(k) should be connected to your checking account via direct deposit (talk to your HR rep about setting this up — it takes 10 minutes to fill out a form). Then log into your Roth IRA, savings account, and credit card, where you can link your checking account to them. Finally, there are some bills that can’t be paid through your checking account, like your rent. For those, use your checking account’s free bill-pay feature so they automatically issue your landlord a check on the precise date it’s due. Now, you never have to manually write a check again. Now that all your accounts are linked, it’s time to go back into your accounts and automate all transfers and payments. This is really simple: It’s just a matter of working with each individual account’s website to make sure your payment or transfer is set up for the amount you want and on the date you want. Most people neglect one thing when automating: dates. If you set automatic transfers at weird times, it will inevitably necessitate more work, which will make you resent and eventually ignore your personal-finance infrastructure. For example, if your credit card is due on the 1st of the month, but you don’t get paid until the 15th, how does that work? If you don’t synchronize all your bills, you’ll have to pay things at different times and that will require you to reconcile accounts. Which you won’t do. The easiest way to avoid this is to get all your bills on the same schedule. To accomplish this, get all your bills together, call the companies, and ask them to switch your billing dates. Most of these will take five minutes each to do. There may be a couple of months of odd billing as your accounts adjust, but it will smooth itself out after that. If you’re paid on the 1st of the month, I suggest switching all your bills to arrive on or around that time, too. Call and say this: “Hi, I’m currently being billed on the 17th of each month, and I’d like to change that to the 1st of the month. Do I need to do anything besides ask right here on the phone?” Of course, depending on your situation, you can request any billing date that will be easy for you. Now that you’ve got everything coming at the beginning of the month, it’s time to actually go in and set up your transfers. Here’s how to arrange your Automatic Money Flow, assuming you get paid on the 1st of the month. 2nd of the month: Part of your paycheck is automatically sent to your 401(k). The remainder (your “take-home pay”) is direct-deposited into your checking account. Even though you’re paid on the 1st, the money may not show up in your account until the 2nd, so be sure to account for that. Remember, you’re treating your checking account like your e-mail inbox— first, everything goes there, then it’s filtered away to the appropriate place. Note: The first time you set this up, leave a buffer amount of money—I recommend $500—in your checking account just in case a transfer doesn’t go right. And don’t worry: If something does go wrong, use the negotiation tips above to get any overdraft fees waived. 5th of the month: Automatic transfer to your savings account. Log in to your savings account and set up an automatic transfer from your checking account to your savings account on the 5th of every month. Waiting until the 5th of the month gives you some leeway. If, for some reason, your paycheck doesn’t show up on the 1st of the month, you’ll have four days to correct things or cancel that month’s automatic transfer. Don’t just set up the transfer. Remember to set the amount, too. Use the percentage of your monthly income that you established for savings in your Conscious Spending Plan (from Chapter 4 of my book; typically 5 to 10 percent). But if you can’t afford that much right now, don’t worry—just set up an automatic transfer for $5 to prove to yourself that it works. The amount is important: $5 won’t be missed, but once you see how it’s all working together, it’s much easier to add to that amount. 5th of the month: Automatic transfer to your Roth IRA. To set this up, log in to your investment account and create an automatic transfer from your checking account to your investment account. Refer to your Conscious Spending Plan to calculate the amount of the transfer. It should be approximately 10 percent of your take-home pay, minus the amount you send to your 401(k). 7th of the month: Auto-pay for any monthly bills you have. Log in to any regular payments you have, like cable, utilities, car payments, or student loans, and set up automatic payments to occur on the 7th of each month. I prefer to pay my bills using my credit card, because I earn points, I get automatic consumer protection and little-known benefits, and I can easily track my spending on online sites like Mint, Quicken, or Wesabe. But if your merchant doesn’t accept credit cards, they should let you pay the bill directly from your checking account, so set up an automatic payment from there if needed. By the way, while you’re logged in to your credit card account, also set up an e-mail notification (this is typically under “Notifications” or “Bills”) to send you a monthly link to your bill, so you can review it before the money is automatically transferred out of your checking account. This is helpful in case your bill unexpectedly exceeds the amount available in your checking account—that way you can adjust the amount you pay that month. That’s the basic Automatic Money Flow schedule, but you may not be paid on a straight once-a-month schedule. That’s not a problem. You can just adjust the above system to match your payment schedule. If you’re paid twice a month: I suggest replicating the above system on the 1st and the 15th—with half the money each time. This is easy enough, but the one thing to watch with this is paying your bills. If the second payment (on the 15th) will miss the due dates for any of your bills, be sure that you set it so that those bills are paid in full during the payment on the 1st. Another way to work your system is to do half the payments with one paycheck (retirement, fixed costs) and half the payments with the second paycheck (savings, guilt-free spending), but that can get clunky. are difficult to plan for. Some months you might earn close to nothing, others you’re flush with cash. This situation calls for some changes to your spending and savings. First—and this is different from the Conscious Spending Plan—you’ll need to figure out how much you need to survive on each month. This is the bare minimum: rent, utilities, food, loan payments—just the basics. Those are your bare-bones monthly necessities. 1. Forget about investing while you’re setting up the buffer, and instead take any money you would have invested and send it to your savings account. 2. In good months, any extra dollar you make should go into your buffer savings. Once you’ve saved up three months of money as a cushion, congratulations! Now go back to a normal Conscious Spending Plan where you send money to investing accounts. Because you’re self- employed, you probably don’t have access to a traditional 401(k), but you should look into a Solo 401(k) and SEP-IRA, which are great alternatives. Just keep in mind that it’s probably wise to sock away a little more into your savings account in good months to make up for the less profitable ones. If you have an irregular income, I highly recommend using YouNeedABudget as a planning tool. It uses a forward-looking system that’s very helpful if you don’t know what you’re going to make next month. are your bills paid automatically and on time, but you’re actually saving and investing money each month. The beauty of this system is that it works without your involvement and it’s flexible enough to add or remove accounts any time. You’re accumulating money by default. Most importantly, whenever you’re eating out, or you decide to buy a new pair of shoes or fly out to visit your friends or get the “Pro” version of that web app you’ve been eyeing, you won’t feel guilty because you’ll KNOW that your finances are being handled — automatically. 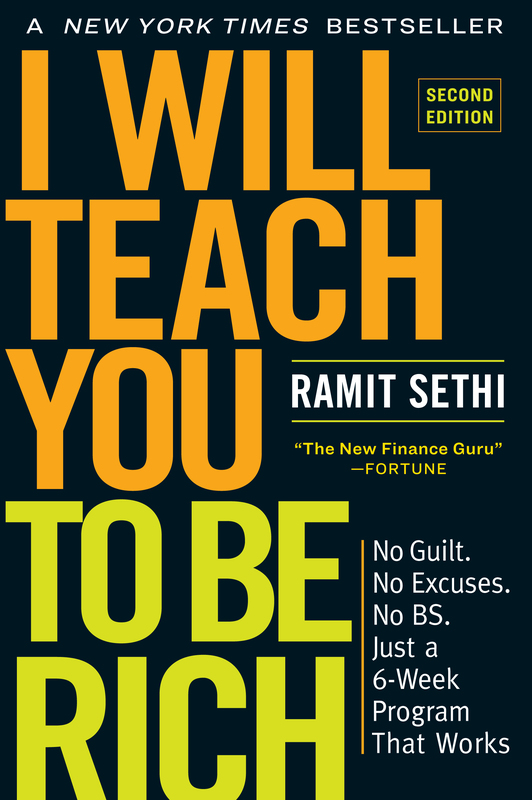 Excerpt from Ramit Sethi’s new book, I Will Teach You To Be Rich. Used with permission. This is exactly what I needed before the new year starts so I can start a solid foundation in my finances. Also, would you currently say that ING Direct is still a good choice? Even though they are under Capital One’s control? (I had past debt/issues with them in the past and I prefer not to be associated with them anymore).